There comes a time when a “new” technology either changes the world or dies off—though it may be hard to know when it reaches such a threshold moment. If a trio of analysts with Bank of America Merrill Lynch is right, 2016 could be a turning point for a few segments of tech. It could also bring long-term changes to several industries. On Tuesday, Bank of America Merrill Lynch invited reporters to its New York offices overlooking Bryant Park to talk about what could be in store next year for the economy as a whole, along with a special focus on disruptive technology. Some of the assertions pointed to technology that has been rather long in development, while a couple of breakouts had quickly affected their industries. 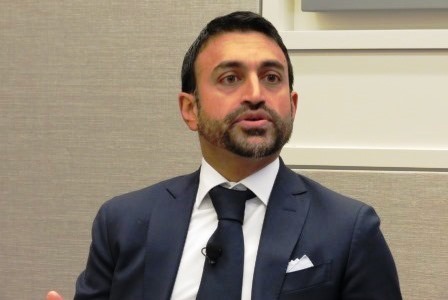 Cleantech could start rounding the corner on being a more substantial part of our energy resources, according to Sarbjit Nahal (pictured), equity strategist with Bank of America Merrill Lynch. Though some may still argue about the degree to which climate change is a real problem, Nahal made it clear what his research pointed to. “This issue is real; it’s now; it’s scary,” he said. “We’ve entered uncharted territory.” One of the telling indicators, Nahal said, is the concentration of carbon dioxide in the air and the rise in temperature since the industrial age began. “We’re halfway to a level we think will be potentially catastrophic in terms of long-term impacts of climate change,” he said. Extreme weather and other environmental damage could hurt the national GDP, but Nahal said more and more investments are being made in ideas to combat this. “Cleantech funding has increased by close to fourfold over the course of the last decade,” he said, which he estimates to be $300-350 billion invested annually over the last five years. As the shift away from fossil fuels continues over the next 15 years, he said, wind and solar energy could be big players and make up 70 to 80 percent of new capacity on the grid, especially as costs for those technologies come down. A different sort of revolution is already underway, it seems, in the hospitality world. It may be a hot button topic for legislators in some cities and states who want to regulate or even ban the company’s service, but Airbnb has quickly made its presence known—particularly for hoteliers. Gaming, lodging, and leisure analyst Shaun Kelley said Airbnb represents about 1 to 2 percent of the U.S. hotel industry demand today, and roughly 2 to 4 percent of the hotel industry’s supply. “Overall Airbnb, in August, was booking 1 million to 2 million room nights in the U.S.,” he said. That compares with 110 million room nights at traditional hotels. A factor in the disruption Airbnb brings to the hotel scene is the nontraditional inventory it lists, which can include apartments, houses, tree houses, or even cars. “There’s an enterprising individual who is renting vans in Queens that you can book on Airbnb as a substitute for a hotel room,” Kelley said. As it stands now, Airbnb is looking for more people to list their residences because the demand outpaces its supply, he said. For now, Airbnb might just be a thorn in the side of the industry from a broad perspective, Kelley said, but it is starting to have an impact on cities that are popular travel destinations. “There’s not one hotelier in New York City who wouldn’t tell you that this is a problem,” he said. In the television world, it seems the tech revolution has already happened and the incumbents are desperately racing to catch up. Jessica Reif Cohen, the bank’s U.S. media and cable analyst, said the audience has the means to choose when and where they watch shows and movies, rather than be beholden to broadcasters and cable companies. Gone are the days when the audience had to rush home at specific times and sit through commercials to watch shows they are interested in. Now viewers can pay subscriptions to cut out the ads and view programs on their smartphones at their leisure. In this post-DVR era, viewers have many options such as video on demand and mobile streaming through Hulu, Amazon, and Netflix—with Apple still teasing at getting into the game. The changes to the media world have turned old advertising business models upside-down, which Cohen said may push incumbents to adopt new strategies to remain relevant. “TV advertising will be addressable and cross platform,” she said, meaning targeted to the viewers on whatever device they are using. For example, a dog owner might see an ad for dog food whereas a cat owner watching the same show could see an ad for cat food during the same advertising break. It should be noted that some of these predicted tech revolutions and disruptions may come in fits and starts. Broadcasters, for instance, have been trying to adapt to viewers who prefer to watch shows on mobile devices—especially after rebellious (and ultimately doomed) upstart Aereo in New York tried to cut them out of the loop. Whatever unfolds in 2016 may surprise us all.